Urban waste waters have high concentrations of nitrogen and phosphorous that must be removed before discharge into rivers or areas nearby natural parks, in order to avoid problems of eutrophication with consequent degradation of environmental quality. Currently, many efficient procedures exist for removing these nutrients but they usually present drawbacks in terms of cost-effectiveness, complexity of operation, waste generation (sludge) and/or high energy consumption. Removal of nitrogen and phosphorous from urban waste waters using a simpler and more inexpensive system based on microalgae was the starting point of the research conducted by several scientists of the TEP-181: Tecnología del Medio Ambiente research group, member of Campus de Excelencia Internacional del Mar (CEI.Mar). Led by Professor José Antonio Perales Vargas-Machuca, a team of experts have developed a new wastewater system for nutrient removal from waste water based on photobiotreatment with microalgae, a process that allows removal of nutrients in darkness. 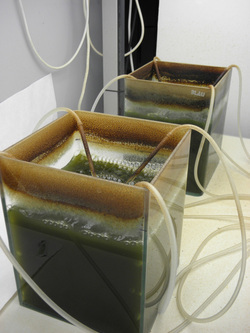 The Basque Institute for Agricultural Research and Development, Neiker-Tecnalia, the public body that reports to the Sub-Ministry for Agriculture, Fisheries and Food Policy of the Government of the Basque Autonomous Community, has confirmed the capacity of Chlamydomonas acidophila microalgae to absorb ammoniacal nitrogen present in the effluent generated in the digestion of organic waste coming from the agri-food sector. These algae can grow in these waste liquids and assimilate the ammonium, which prevents this gas from being volatilised in the form of ammonia (NH3) and contaminating the atmosphere. Furthermore, the microalgae biomass obtained in this procedure can be used as a raw material for producing biogas or used as animal feed, compost or fertilizer besides being an extraordinary source of lutein, a powerful antioxidant used as a food supplement. The decomposition process of agri-food waste in oxygen-free conditions produces effluent that has a high content of ammoniacal nitrogen, specifically between 2 and 5 grams per litre. Significant quantities of this waste is produced on farms and biogas plants, among other facilities. That is why it is essential to find suitable methods for managing it and for preventing the ammonia from being volatilised and ending up in aquifers and surface waters. ﻿BOD/COD Levels: A common problem is the ability to control high BOD/COD (Biological/Chemical Oxygen Demand) levels in a system, i.e. there is not enough oxygen in a wastewater treatment system to do its job. This is usually based on suspicions that the mechanical processes that generate air and oxygen - in relation to the volume capacity of the system - are not functioning well enough or are inadequate. Traditional methods tend to either increase the oxygen levels (dissolved oxygen) and or increase the retention capacity. This is typically the engineering solution and does not always solve the problem. In anaerobic conditions, failures are often due to the incorrect levels of carbon, nitrogen and phosphorous. Liebig's Law states that the productivity of any complex system dependent on numerous essential inputs, is limited by the single variable in least supply. In this case, the anaerobic microbes required to perform the degrading function will die if not provided with the correct balance of nutrients. As they oxidize they produce acid, which disrupts the total balance of the microbial populations. Due to the competitive nature of microbes, the non-beneficial bacteria will dominate producing an excessive level of pathogens and toxins. This will lead to "stalling" or grid-lock and high BOD's with foul odors. ﻿In any wastewater treatment system there is a vast array of microbes present, i.e. aerobic, anaerobic and facultative, each performing specific functions in their respective parts of the system. Each species has a tolerance of ecological minimums and maximums with regard to various conditions: pH, temperature, dissolved oxygen levels and nutrient levels.﻿ The indigenous microbial species found in typical wastewater systems are often overwhelmed by system upsets. Harsh chemicals, disinfectants and chlorination will have a detrimental effect on microbial populations making systems less efficient. Sludge build-ups occur, tank deposits, back-ups, floating grease pads, fouled drain fields are just some of the problems encountered when microbial populations are not maintained at optimum levels. Apply on Day 1, Day 30 and Day 60 with a 36-6-6- NPK Nutrient . Keep the container out of direct sunlight. Stir again every few hours. Nutrient solution will be required, but mixed and applied separately. Apply initial strength of 1 to 2 gallons of hydrated product per cubic meter to get the most even distribution in the soil, depending on aeration technology. Soil moisture should be maintained above 20%, i.e. moist but not wet. Use the higher dose for high levels of contamination to reduce the completion time. Why are Nutrients important in bioaugmentation? The ideal nutrient balance (pathway) required for hydrocarbon remediation should equal Carbon: Nitrogen: Phosphorus at a ratio of 100:10:4. In general, at least 1 ppm (parts per million) of ammonium nitrogen and 0.4 ppm of orthophosphate needs to be present. It is critical to control the inorganic nutrients in order to accelerate bacterial metabolism. Nitrogen, which makes up nearly 15% of the molecular composition of a bacterial cell, is utilized by the bacteria to manufacture its cell walls, nucleic acids and proteins. Phosphorus, in the form of inorganic phosphates, is used by the microorganisms to synthesize phospholipids and nucleic acids and for the energy transfer reactions of ATP. Enzymes that hydrolyze phosphate ester are present in nearly all organisms. Without adequate phosphorus, the ability of the bacteria to utilize hydrocarbons in the soil is sharply decreased. Pathways can be influenced by further adjusting volumes of bio-nutrients. Variations in the signature will be evident while targeting can be achieved with this method. Oxygen is the key. Four pounds of oxygen are required for one pound of hydrocarbon to be remediated. Much of this requirement will come from the atmosphere when using non-photosynthetic microbes. When the hydrocarbons are below the surface of the water, the microbes get their oxygen from the water. A minimum of 1.5 mg/L DO (dissolved oxygen) is required. Surface agitation of air diffusion can be used to supply additional oxygen if required. If the ground is compacted, the ground should be tilled or raked to allow as much oxygen as possible to permeate the soil. The hydrated Petro-Clear can then be sprayed over the tilled soil. For best results, a moisture content of 30 to 40% of the soil's holding capacity should be maintained (this equals around 9% for Texas sands, up to 23% for loams). The soil should be kept moist by adding fresh water. If it cannot be tilled, high-pressure injection of diluted hydrogen peroxide (500 ppm final dose) can be added to the soil to aerate it.